The national drink of both Peru and Chile and both countries lay claim to the origins of the Pisco Sour and indeed the spirit it is made from – something we explore in the Pisco Wars, but as I explain below the earliest known Pisco Sour recipe is of Peruvian origin. All the Peruvian bartenders I've met blend rather than shake their Pisco Sours. Indeed, it is a brilliant blended cocktail and if you want to try this method then add a touch more sugar to my shaken Pisco Sour recipe and blend with a 12oz scoop of crushed ice. However, I prefer my Pisco Sours shaken. While some like to omit the egg white, like most sours it's better made with, although half the white of a small fresh egg white is plenty. I'm an advocate of sugar syrup over caster sugar in all drinks, the Pisco Sour included, but there are plenty of misguided folks who'd argue to the contrary. More worthy of debate is the choice of pisco. My Peruvian friends favour pisco made from the Quebranta grape or even acholado (a blend of varieties). However, I prefer to use Peruvian pisco made from the more aromatic Italia grape, preferably mosto verde Italia pisco. 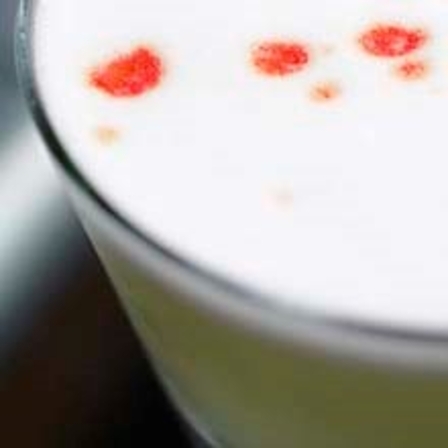 Convention has it that the Pisco Sour is garnished with three drops of bitters dropped symmetrically onto its foaming head. This not only adds to the visual appearance, the aroma of the bitters also helps mask the wet dog-like smell of egg white. 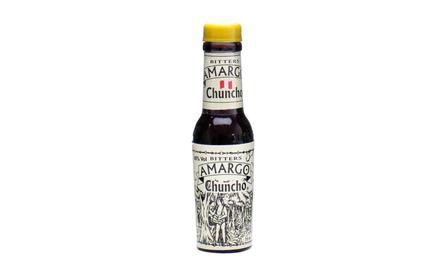 Angostura Aromatic Bitters are fine but for authenticity consider using Peruvian Amargo Chuncho bitters which are based on various Amazonian barks and herbs. Some also dust the surface of the drink, or the rim of the glass, with cinnamon. Somewhat controversially, if the use of Italia pisco were not enough, I also like to add a dash of orange flower water to my Pisco Sours. 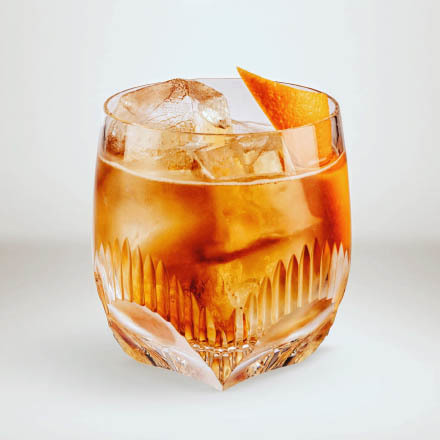 I also tend to serve them straight-up in a frozen heavy bottomed old-fashioned glass to help retain the drinks cold temperature but a frozen coupe also works well. Like so many vintage cocktails, the documented origins of the Pisco Sour have changed over recent years as evidence of earlier origins has been discovered. Back in the mid-1980s, a Chilean newspaper, El Comercio de Iquique, reported that the pisco sour was created in 1872 by Elliot Stubb, an English steward from a sailing ship named Sunshine, who opened a bar in the then Peruvian port of Iquique (now in northern Chile). 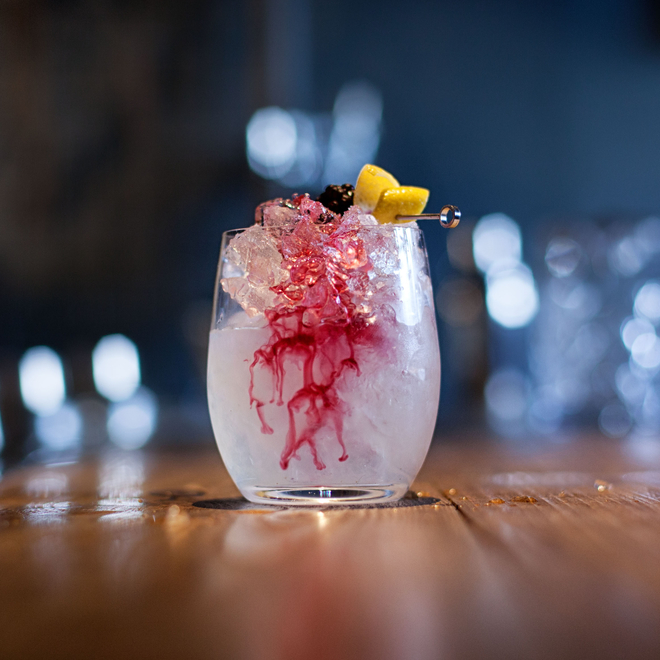 However, closer scrutiny shows a quote attributed to Stubb was actually about the whiskey sour, the forerunner to the pisco sour, the origins of which lie even earlier in the United States. In 2009, Luis Guillermo Toro-Lira Stahl and Michael P. Morris published a document "Clarifying the legends in the history of pisco sour". This traced the origins of the Pisco Sour to Victor Vaughen Morris Jones (Victor Morris), the grandfather of one of the authors. Victor Morris, originated from Salt Lake City, Utah, but immigrated to Peru in 1903, initially working as a cashier for the Cerro de Pasco Railroad railway company in the town of Cerro de Pasco. 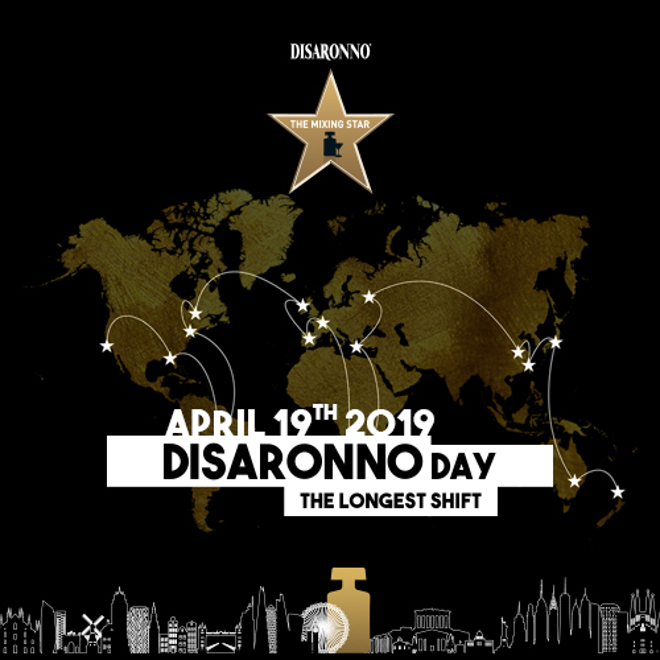 Legend, and indeed members of his family, say that while working here at the inauguration of the line from Oroyo, Morris created the Pisco Sour after running out of whiskey for the Whiskey Sours he was making for the reported 5,000 people in attendance. Morris moved to Lima, where, backed by long term friend Daniel C. Babbitt, on 1st April 1916 he opened the appropriately named Morris' Bar at 847 Calle Boza. Here, Morris, who was also known by his nickname Gringo, became noted for his Pisco Sours and the bar prospered. The bar's original 82 page visitor books, titled 'Morris' Bar Register', still in the hands of the Morris family, records more than 2,200 signatures, their names showing that it was a high end establishment attracting many visiting Americans including diplomats, businessmen, lawyers and journalists. 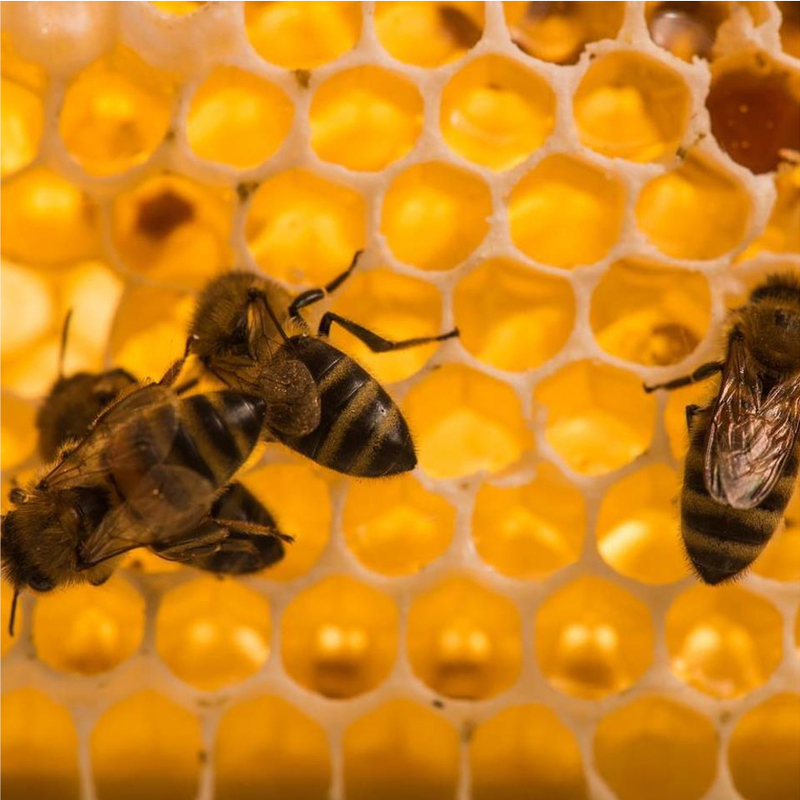 Notable names in the journal include: Emiliano Figueroa, former president of Chile and ambassador to Peru; millionaire Roger W. Straus and Elmer Faucett, founder of the Company of Faucett Aviation. Perhaps most interesting is John Lannes from the Bank Exchange in San Francisco, famous for the Pisco Punch. Numerous remarks from visitors in this register testify to the delicious nature of Morris' pisco sours. As does a July 1924 notice for the Morris' Bar in the South Pacific Mail, a newspaper from the Chilean port of Valparaiso published weekly in English by Nelson Rounsevell, a friend of Morris who had also worked in Cerro de Pasco. The advert asks, "Have you registered at the Morris Bar LIMA? It goes on the say the register at the bar can be helpful to contact [English-speaking] acquaintances and ends with "has been known for many years for their 'Pisco Sours'." An earlier mention of the Pisco Sour in the 22nd April 1921 edition of the Peruvian magazine Mundial, describes the drink as a white-coloured beverage and attributes its invention to "Mister Morris." 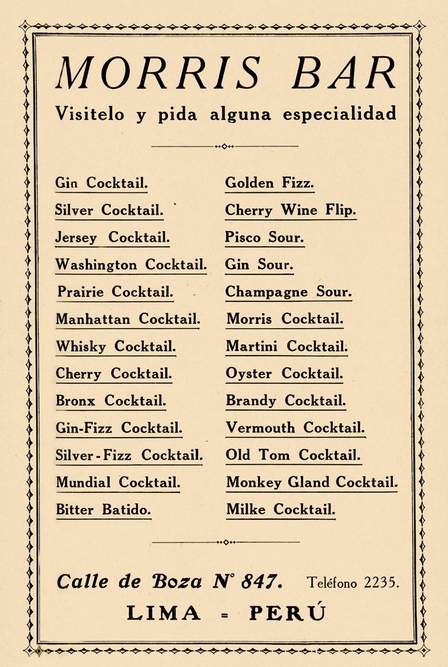 The 1929 Lima directory - The City of the Viceroys, lists the Pisco Sour as one of Morris Bar's cocktails under the heading "visitelo y pida alguna especialidad" (visit it and ask some specialty). Sadly for Victor it appears that bartenders working at Morris' Bar left, taking his recipe with them to nearby establishments with bars such as the Hotel Bolivar (opened December 1924) and the Lima Country Club (opened February 1927). The competition for wealthy foreign guests obviously had detrimental effect on his bar's success. Victor's fortunes and his health declined eventually leading to his declaring voluntary bankruptcy and the closure of the Morris Bar in 1929. He died a few months later, on 11th June, of cirrhosis aged 56. In December, Morris' wife, Maria Vargas emigrated to San Francisco, California with their three children. With is large turnover of guests, the bar at The Hotel Bolivar which was largely staffed by ex-Morris' bartenders, is widely credited for spreading the popularity of the Pisco Sour. 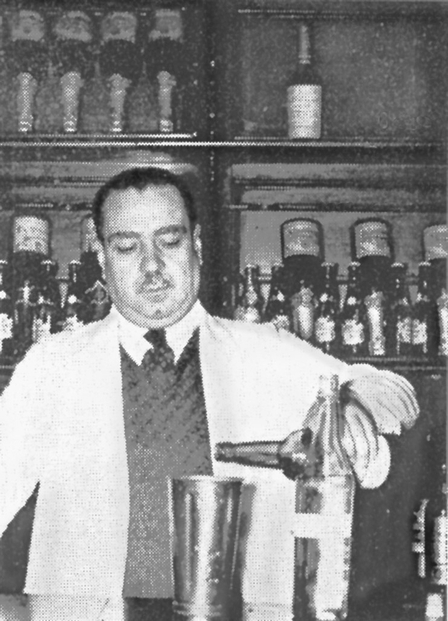 The drinks survival is also attributed to Mario Alfonso Bruijet Burgos, a bartender who worked at Morris' Bar from 1924 and continued serving Pisco Sours at the Hotel Maury until his retirement. 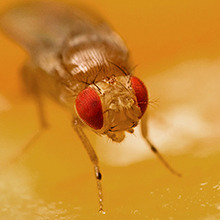 Some say that it is Bruijet who added bitters to the recipe after his move to the Maury. 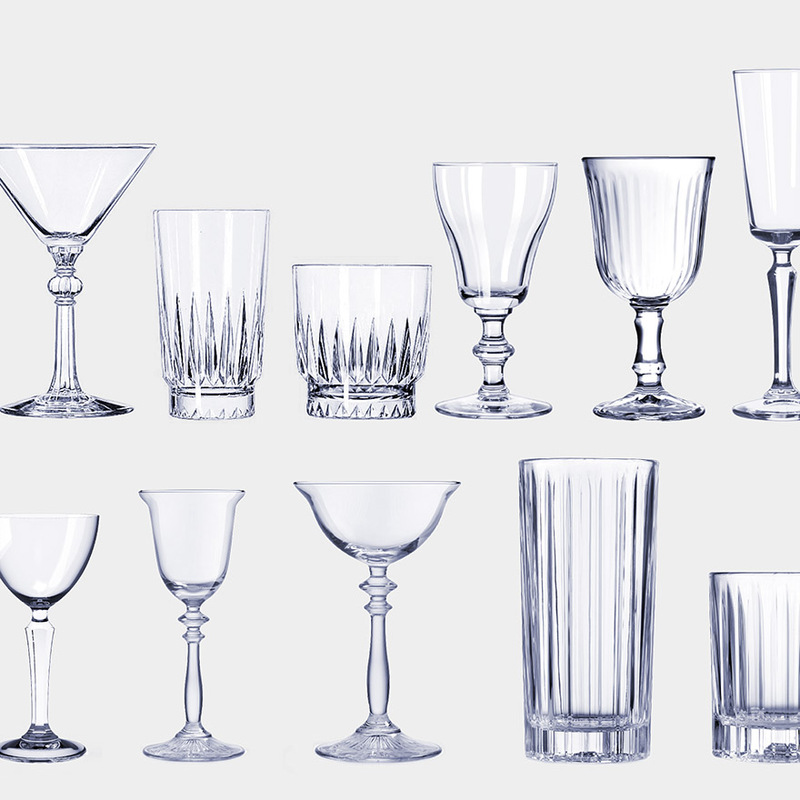 With a few twists, turns and variations, the above was the accepted origin of the Pisco Sour. That was until 22nd February 2012, when Peruvian writer Raúl Rivera Escobar uploaded a scan of a pamphlet published in Lima in 1903 by S.E. Ledesma to this internet page. Titled Nuevo Manual de Cocina a la Criolla, 'New Manual of Creole Cooking', on page 32, among the food recipes, this includes a recipe simply titled 'Cocktail', containing an "egg white, a cup of pisco, a teaspoon of sugar and a few drops of lime juice to taste". Obviously a Pisco Sour, this is the earliest known recipe. 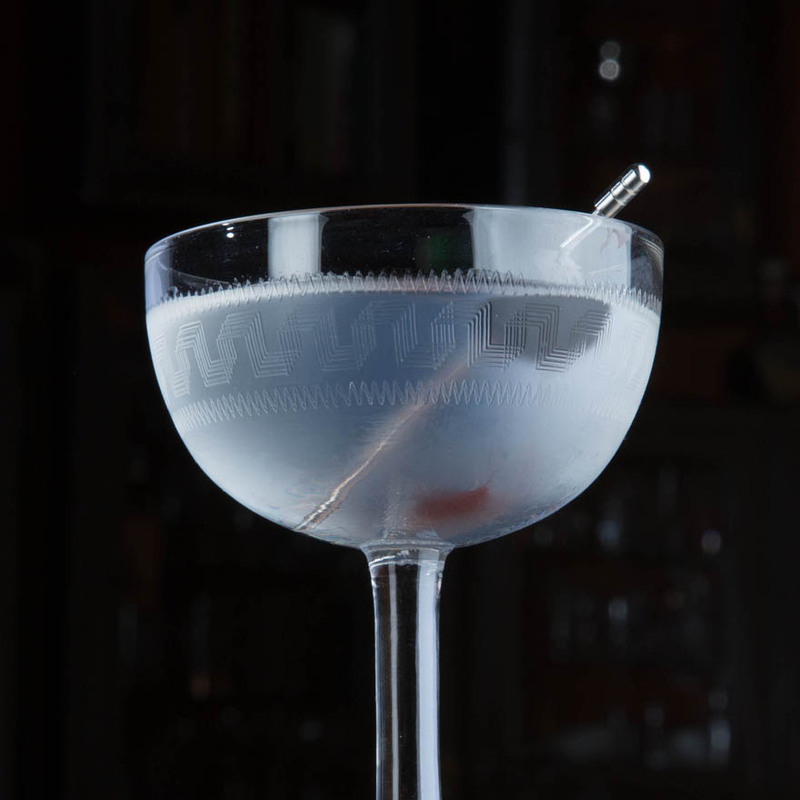 Translation of 'Cocktail': An egg, a glass of pisco, a teaspoon of fine sugar and a squeeze of lime, will open up a good appetite. You can make up to three cups with an egg and a well rounded teaspoon of fine sugar, adding otherwise much more per cup. Hit [shake] all this in a shaker or punch bowl, to form a little punch. Nuevo Manual de Cocina a la Criolla proves that Victor Morris didn't create the Pisco Sour and also shows that Mario Bruijet was not responsible for adding egg white to the recipe while working at Hotel Maury, as previously suggested by some. So the Pisco Sour dates from before 1903 and looks to be of Peruvian rather than Chilean origin. We shall probably never know who was first to take a Whiskey Sour recipe and use pisco as the base spirit. Or indeed who was first to add bitters to it. It's a wonderful coincidence that Victor Morris also emigrated to Peru in 1903. The drinks recent popularity outside of its native Peru and Chile is attributed to Joe Baum who promoted the drink in the 1960s at La Fonda Del Sol in New York. The popularity of the Pisco Sour continues to grow and International Pisco Sour Day is celebrated around the world on the first Saturday in February every year.